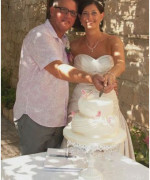 Chris and Tanya chose Stella Virdi as their wedding planner. Stella got in touch with us some 16 months before the wedding date and put us in touch with Chris and Tanya so that we could discuss design and cake flavours directly. With theme colours of white and grey (the bridesmaids dresses) we all set to work discussing ideas by email. 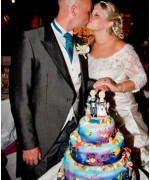 Tanya wanted us to know that Chris liked cake very much indeed and with 50 guests a three tier cake was agreed. We decided to get some face to face discussions going on Skype one Sunday morning and it really was so nice to see the faces of our bride and groom to be! We did a sketch of our proposal, which was accepted. 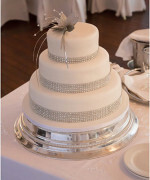 We put lots of glittery detail on the cake with inspiration from Tanya’s dress. All Tanya had to do was find a brooch that she liked and bring it with her. 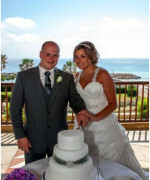 The wedding was on the Armonia Terrace at the Coral Beach Hotel on a beautiful May day. The amazing Dimitri Katchis took some fantastic photos, including the one here. Just wanted to say a BIG BIG THANK YOU for all your help and advice and of course for the most beautiful wedding cake. It was perfect, just what I wanted, so classy everyone at our wedding loved it and I had many comments made to me throughout the night and days after about how stunning it was not to mention how delicious it was. I had a piece of each tier and I honestly couldn’t choose a favorite they was all so great, you did a smashing job and I can’t thank you enough. The cookies went down a treat, everyone loved them and the names on them especially the nick names, I know a lot of people didn’t eat theirs and have kept them….but not for long I bet. I loved Costa’s and mine the detail was fantastic so so cute. We will definitely be recommending you to all our family in Cyprus and any friends that may visit and may need a cake for any future parties, wedding etc. I wish you both well, take care and keep up the fantastic work!! Just wanted to say we are back in cold UK, not loving it much. Really didn’t want to leave lol. We both wanted to say thank you for making the most amazing cake, I only I had ordered a bigger one, we appeared to have some greedy guests lol!!! I loved it, it tasted amazing, I think everyone went back for seconds and possibly thirds, well, apart from me – I was too full I think with all the excitement of the day. I am pleased that everyone and all the guests said how gorgeous it looked. I would also like to thank you for all your support on the build up to the wedding, I have to say between you and Nicky of Cyprus Images you have both been amazing and such lovely people too, which made things to easy. Jackie – you made our day with this cake!! Most probably one of my favourite parts of the day when I saw it, and it was delicious also – a total masterpiece!!! Our family and friends thought it was AMAZING!!! Thank you! !